↑ "gondwana". Dictionary.com. Lexico Publishing Group. http://dictionary.reference.com/browse/gondwana. Hinango noong 2010-01-18. ↑ "Gondwanaland". Merriam-Webster Online Dictionary. 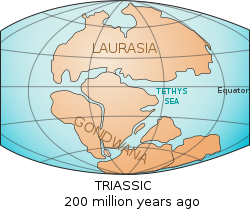 http://www.merriam-webster.com/dictionary/gondwana. Hinango noong 2010-01-18. ↑ Buchan, Craig (November 7–10, 2004). "Paper No. 207-8 - Linking Subduction Initiation, Accretionary Orogenesis And Supercontinent Assembly" in 2004 Denver Annual Meeting., Geological Society of America. Retrieved on 2010-01-18. ↑ Houseman, Greg. "Dispersal of Gondwanaland". University of Leeds. http://homepages.see.leeds.ac.uk/~eargah/Gond.html. Hinango noong 21 Oct 2008. Huling pagbabago: 12:54, 12 Marso 2013.